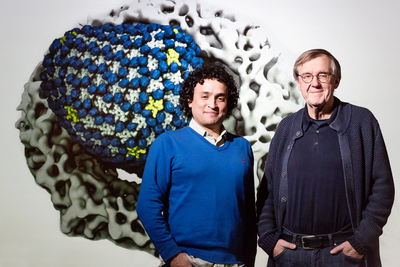 Physics professor Klaus Schulten and postdoctoral researcher Juan R. Perilla conducted a 64-million-atom simulation of the HIV capsid. 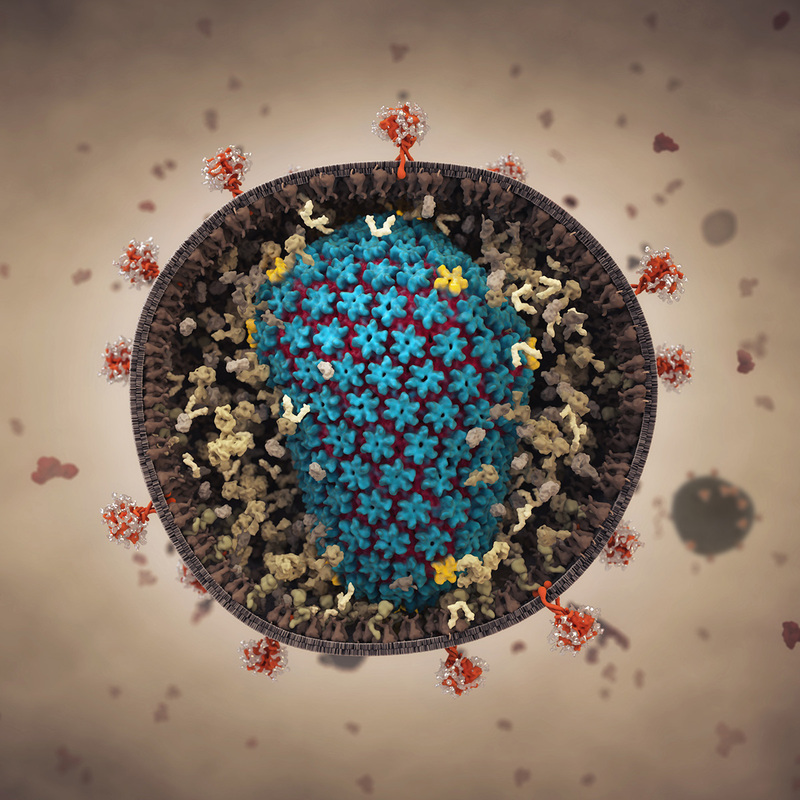 Video shows simulation of HIV capsid. Yellow and blue particles are ions flowing into and out of the capsid. CHAMPAIGN, Ill. — It took two years on a supercomputer to simulate 1.2 microseconds in the life of the HIV capsid, a protein cage that shuttles the HIV virus to the nucleus of a human cell. The 64-million-atom simulation offers new insights into how the virus senses its environment and completes its infective cycle. The genetic material of the HIV virus is encased in multiple structures that hide it from the host immune system. The capsid, in blue, protects the virus after it enters a cell and shuttles it to the nucleus, where it completes the process of infection. "We are learning the details of the HIV capsid system, not just the structure but also how it changes its environment and responds to its environment," said University of Illinois research scientist Juan R. Perilla, who led the study with U. of I. physics professor Klaus Schulten. Such details could help scientists find new ways to defeat the virus, Perilla said. Schulten, who died in October 2016, pioneered the application of molecular dynamics simulations to study large biological systems. He called the method "computational microscopy." The capsid simulation was performed on the Department of Energy's Titan supercomputer. Analyzing the data required a second supercomputer, Blue Waters, at the National Center for Supercomputing Applications at the U. of I. 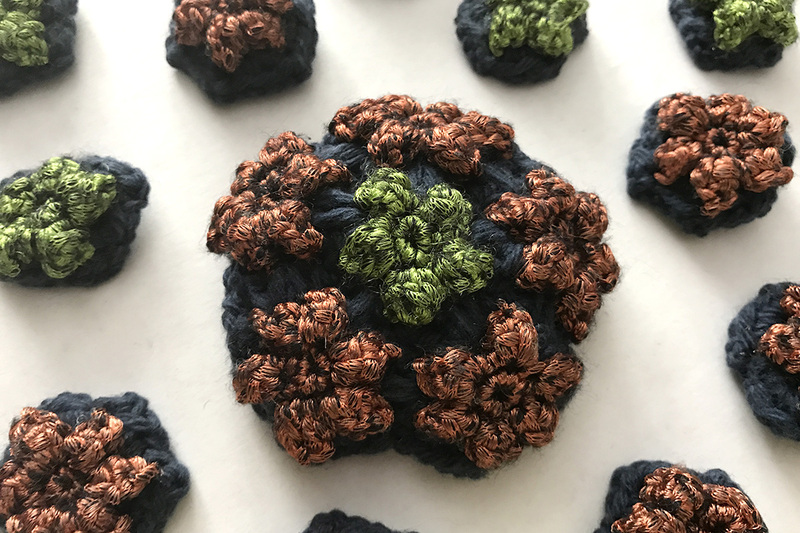 This is a crocheted depiction of the protein structures that make up the HIV capsid. The identical proteins are arrayed in a series of pentamers, seen here in green, and hexamers, in orange, that together give the capsid its conical shape. A pore lies at the center of each grouping of proteins. The HIV capsid is made up of hundreds of identical proteins arrayed in a network of six-sided and five-sided structures, each with a tiny pore at its center. The capsid contains the virus's genetic material, hiding it from host cell defenses. It also transports the virus to the cell nucleus, which it must infiltrate to complete infection. 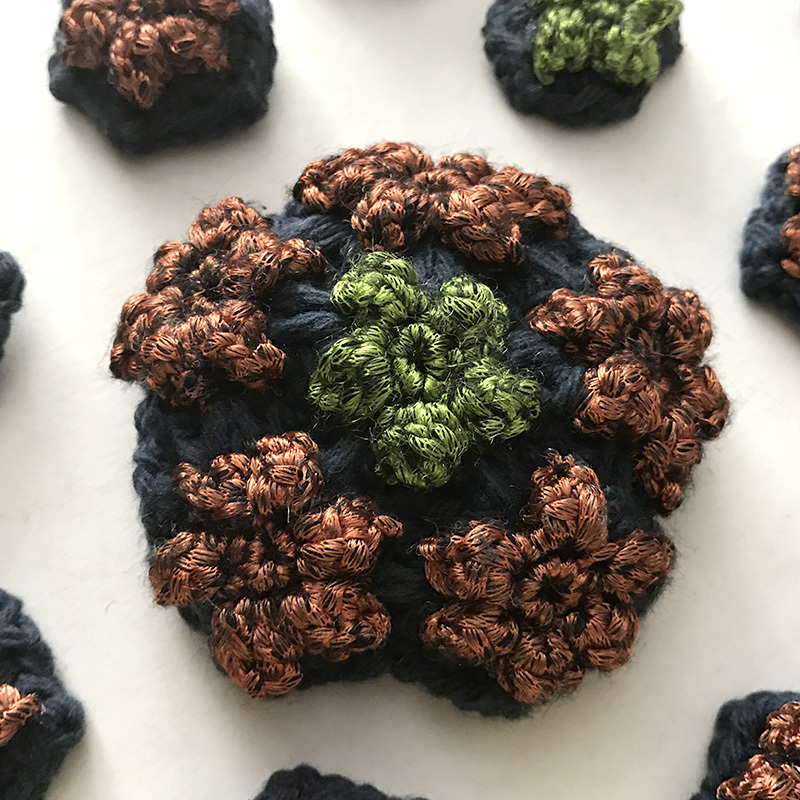 The new study revealed several properties that likely enhance the capsid's ability to sense its environment and find its way to the nucleus, Perilla said. It showed, for example, that different parts of the capsid oscillate at different frequencies. These oscillations likely transmit information from one part of the capsid to another, he said. "If you can break this electrostatic balance that the capsid is trying to keep together, you may be able to force it to burst prematurely," Perilla said. The positively charged interior also could help facilitate the influx of DNA building blocks. The virus needs these molecules from the host to convert its own RNA into DNA, Perilla said. These DNA building blocks, called nucleotides, carry a negative charge and are small enough to pass through the capsid's pores, he said. Perilla and Schulten are associated with the Beckman Institute for Advanced Science and Technology at the U. of I. The National Science Foundation and the National Institutes of Health support this research. To reach Juan Perilla, call 217-244-7403; email jperilla@illinois.edu. The paper "Physical properties of the HIV-1 capsid from all-atom molecular dynamics simulations" is available online and from the U. of I. News Bureau.